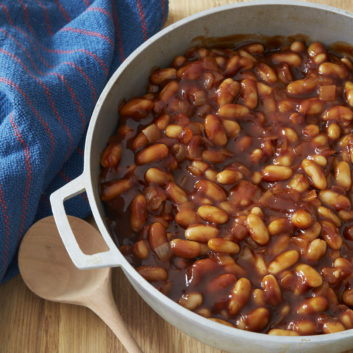 Baked beans are certainly a convenient side (simply pop and pour), but canned versions are often packed with sodium and sugar. My health-ified versions calls for just four simple ingredients. As the star of this dish, beans provide plant-based protein, soluble fiber, and other heart-healthy nutrients. My “secret” ingredient, balsamic vinegar, delivers a serious depth of flavor that takes the dish to another level. This recipe is tangy, sweet, shockingly low in sugar and a cinch to put together. Go ahead, kick that canned stuff to the curb. Mist a skillet with oil spray and sauté the onion for 8 to 10 minutes, until soft and translucent. Remove from the heat. Add the beans, sauce, and vinegar to the onions. Stir until well combined. Transfer the mixture to an oven-safe baking dish and bake, uncovered, for 60 minutes until sauce is thick.